﻿• Typical applications: Ground support equipment, die carts, and aircraft engine stands. • Leg thickness: 1/2” adds extra strength and durability. 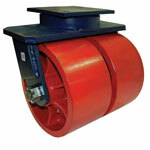 • Wheels: Either 3”, 4”, 5” or 6” wide depending upon wheel size and type. Wheels have either a 3/4”, 1”, 1-1/4” or 1-1/2” roller bearing or 3/4”, 1”, 1-1/4” tapered wheel bearings. Roller bearing wheels rotate on a hardened and ground spanner, tapered wheel bearings rotate on the axle. All wheels are equipped with lubrication fittings. • Raceway Design: Patented Kingpinless single ball bearing precision machined raceway hardened to 53 Rockwell C. minimum. 7” diameter raceway with 3/4” diameter ball bearings. 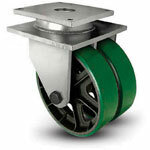 • Wheels: Either 4”, 5” or 6” wide depending upon diameter and wheel type. Roller bearing wheels are equipped with a bearing which rotates on hardened and ground spanners. Tapered bearing wheels have a 1-1/4” I.D. tapered bearing which rotate directly on a 1-1/4” axle. All wheels have lubrication fittings. ﻿Load Capacity	Up to 30,000 lbs. • Swivel Section: 7/8" ball bearings mounted in a 7" diameter precision machined raceway. Zerk in swivel section. ﻿Load Capacity	Up to 25,300 lbs. • Combination of heavy duty opposed spherical roller thrust bearings in the swivel head allows this caster to swivel easily even under the most punishing conditions. • Wheels: Wheels are either 3", 4", 5" or 6" wide depending upon wheel size and type. Wheels have either a 3/4", 1", 1-1/4" or 1-1/2" roller bearing or 3/4", 1", 1-1/4" tapered wheel bearings. Roller bearing wheels rotate on a hardened and ground spanner, tapered wheel bearings rotate on the axle. All wheels are equipped with lubrication fittings. • Mounting Plate Size: 8-1/2" x 8-1/2" x 1/2"
• Bolt Hole Spacing: 7" x 7"
• Mounting Bolt Diameter: 5/8"
Raceway Design: Patented Kingpinless™ single ball bearing precision machined raceway hardened to 53 Rockwell C. minimum. 7” diameter raceway with 3/4” diameter ball bearings. 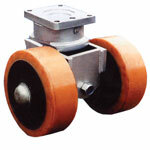 Wheels: Wheels are either 4”, 5” or 6” wide depending upon diameter and wheel type. Roller bearing wheels are equipped with a bearing which rotates on hardened and ground spanners. Tapered bearing wheels have a 1-1/4” I.D. 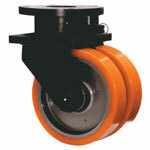 tapered bearing which rotate directly on a 1-1/4” axle. All wheels have lubrication fittings. ﻿Load Capacity	Up to 26,400 lbs.